‘Founding fathers’ for Circle Michigan included Bill Shepler, owner of Shepler‘s Mackinac Island Ferry, Dave Schulte (who was then Director of the Flint CVB) and Don Keller, owner of the Bavarian Inn in Frankenmuth, Michigan. Undisputed and big Upper Peninsula supporters of Circle Michigan were Don and Steve Welch and Jerry Peters of the Soo Locks Boat Tours in Sault Ste. Marie while the Nelis family of Dutch Village in Holland represented the west side of Michigan. Circle Michigan celebrates over 35 years in existence. www.circlemichigan.com is the place to experience Michigan, find creative tour ideas and find everything a tour planner needs to develop successful group tours to our state. 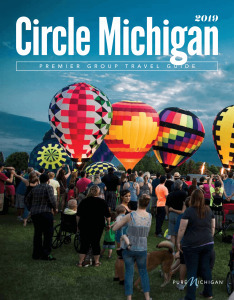 Circle Michigan is dedicated exclusively to helping professional tour planners and suppliers meet the challenges unique to the group travel industry.